Speed through tasks, using a wide range of productivity and workflow features-while consistently producing professional-quality prints. 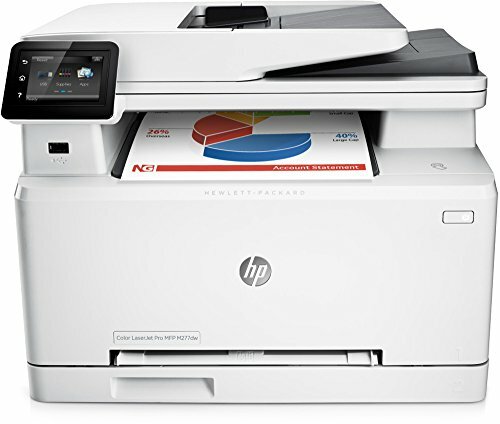 This loaded MFP gives you the tools you need to get the job done quickly. Stay on top of pressing business demands-whether you're in the office or on the go. HP's wide range of mobile printing features let you work securely from wherever business takes you. Bring out the best in your MFP. Get more high-quality pages than ever, using Original HP Toner cartridges with Jet Intelligence. Help ensure peak printing performance, and get the authentic HP quality you paid for-unmatched by the competition. Seamlessly manage the flow of information to and from your devices, using innovative HP Jet Advantage business workflow and printing solutions. Increase MFP and data security, and stay connected to your work with wired and wireless capabilities. This HP Printer is compatible with Windows 10 (printer driver update may be required) . Kindly refer the user manual given below for troubleshooting steps.